Someone once said, “Somewhere between the bottom of the climb and summit is answer to the mystery, why we climb”. My trek to Kaiwara, my first trek ever was pretty much based on the above quote, to find what all the hype about trekking and hiking really was (since my sister is one of the organiser’s of BTC and she goes on and on about it J). So when BTC put up a trek event to Kaiwara, I jumped at the opportunity to register and I was lucky enough to be short listed. The event required us to meet up at 6’O clock at their regular spot Shantala Silk House. They had arranged a Tempo traveller to pick us up. 20 of us had registered and slowly in groups of twos and threes the members joined us, however only 19 of us turned up and we left without the other person. The T.T engine revered and thus began our journey to Kaiwara. The roads were clear with minimum traffic and we could see many other bikers gearing up for their weekend gateway. But we had to stop on the way to pick up our 20th member, who had apparently missed his alarm :-P. After a while, he joined us and we continued on. My companion was Lalitha, a software engineer, we talked about work, city and such, when the organisers announced a game of Dumb charades. The game was fun and witty and required each of us to enact a movie. I appreciated the involvement of the organisers, who made sure all of us participated. Most memorable of them all was- ‘Jal bin machali, nach bin bijili’ and ‘Howrah bridge mein latak raha lash’ forgive me if I’ve misspelt them. With the game continuing on, we reached Kaiwara and stopped at a local store for breakfast. 20 plate of steaming hot, buttery soft Idly and Vada came right up, much to everyone’s delight. With our stomachs full and our spirits soaring high, we headed back to the TT. Our destination- Bheema Bakasura Betta, was further ahead. The hill started with stairs and our trekking began. A few steps were enough to put me out of breath. Climbing stairs was monotonous and exhausting and I was disappointed to find myself gasping for air already. Encouraging words and support from the organisers kept me moving on. Fortunately for us the stairs ended and rocks and boulders were to be seen, this eased the trek a little and we soon reached the summit. The view from here was spectacular and the gentle breeze caressed my face, making me forget about the tiring trek in an instant. We waited for the rest of the members and took a few group pics and made our way down the hill. Next on our list was the- Elephant Hill but as luck would have it, the forest department did not give us permission to trek, as they feared a forest fire could break out in the dry months. Dejected we looked around for another hill in the vicinity and chanced upon- The Lonely Hill. The hill had no trail as such and that got us excited. We got stuck time and again as the path ahead was blocked by cactus, thorny bushes, nevertheless we pushed on. I’d like to mention one such incident when a few of us came across a dead end and there was no way around except boulders. With much needed patience, we edged on slowly, trying not to concentrate on the steep hollow beneath us. We finally reached the top and man wasn’t I elated! There is a rare kind of music that you feel rather than hear, when you are atop a hill, the wind roaring, your heart thumping mad, the sound of your own breath and the silence of the hills. The silence, preserved through centuries and heard only by a few who dare to reach the top, almost like a reward from nature. The music strikes a chord so deep that it touches your soul. It gets you addicted to trekking and makes you go back to hear it for long, even as long as your life lasts. 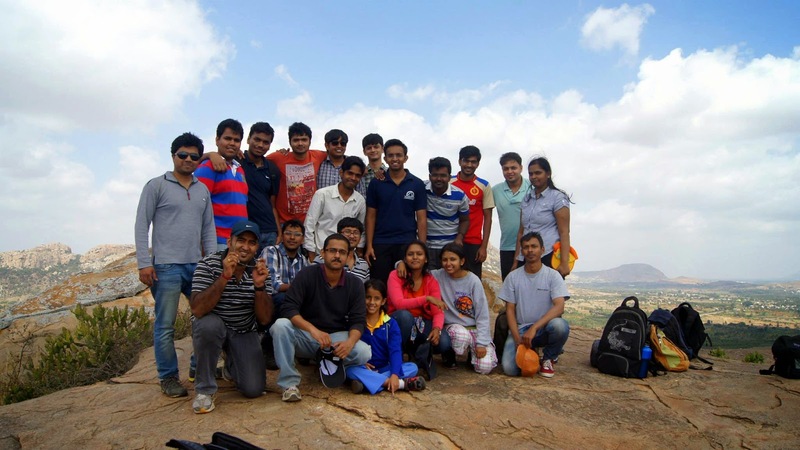 Being my first vacation in Bangalore, I was searching for a great weekend experience. 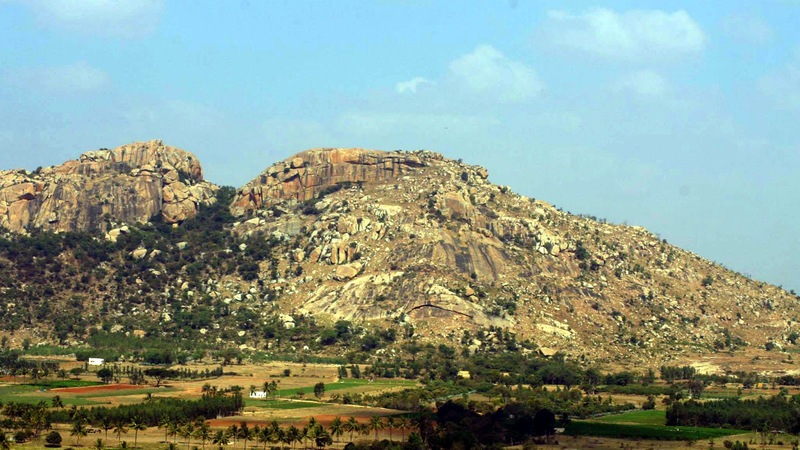 With the information provided by my brother's friend Vaibhav, I came to know about BTC and also came to know that they are organising a trekking plan for Kaivara hills. So I and my bro decided to join this group and it was awesome. Our meeting point was Majestic third terminal and most of us were in time to start at 6AM. We had a stop outside Bangalore for arival of another trekkie. Getting stuck in the traffic, he was 20 mins late. After the arrival of the trekkie, 20 of us finally set out for out destination. On the way, our Organisers Abhishek and Deepthi suggested that we play DumSharads. Shyness in everyone's face made Abhishek to call everyone to participant one by one!!!! It was fun as everyone were taking part and enjoying in their one way :p Meanwhile organisers were making sure that we are in the right direction. Having reached the Kaiwara, we had breakfast at the nearby hotel. Finally, we started trekking at 8:30. 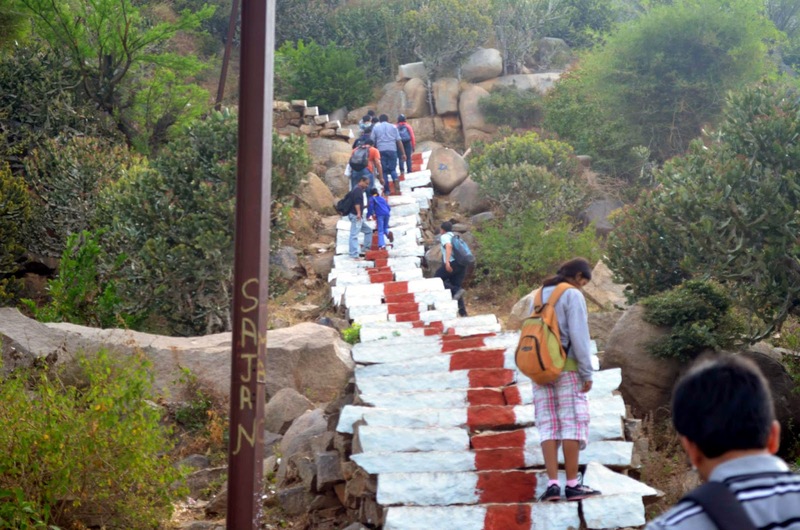 Our first hill of visit was Bhima hill. The hill had path with steps so it was not difficult to climb but it was tiring. The youngest trekkie Deeksha was very excited to climb the hill. The trekkies with cameras Varun, Vinoth and Gaurav were capturing the moments. 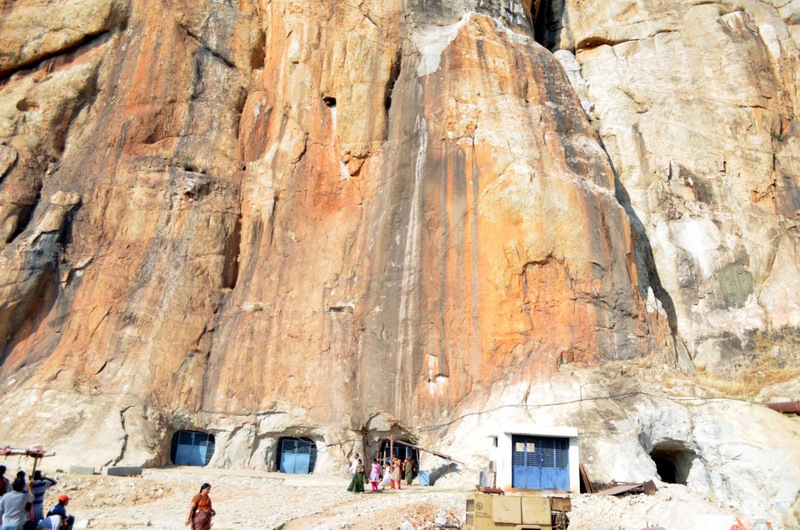 The first ones to reach the top were Anish,Vaibhav,Sudesh. After some photographs, we started getting down. Getting down from the hill was easier. Our second hill plan was cancelled as the forest department refused to give permission. Having tender cocunut at Rs 15!!! we moved on. Our next destination was lonely hill! yes you heard it right lonely hill :p Reaching the place we found out that we had to create our own path. 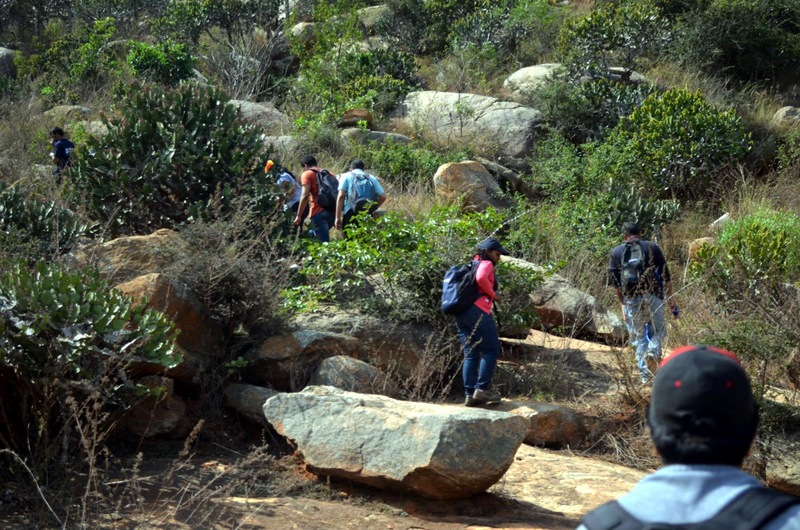 I thought it would be tiring like the Bhima hill but it was exciting as we had to make our own path. Avoiding thorns was the most difficult task. And also the rocks were slippery. At one time we found no path to climb and thought of getting down but thanks to Abhishek who said that it is possible to climb. Reaching the top we had a quick snacks session.Then we started getting down from the hill. There were scratches on most of the trekkies. We then reached the bus and travelled to the temple nearby. Had awesome food in the temple. The temple had writings both in kannada and telugu as we were in the border. 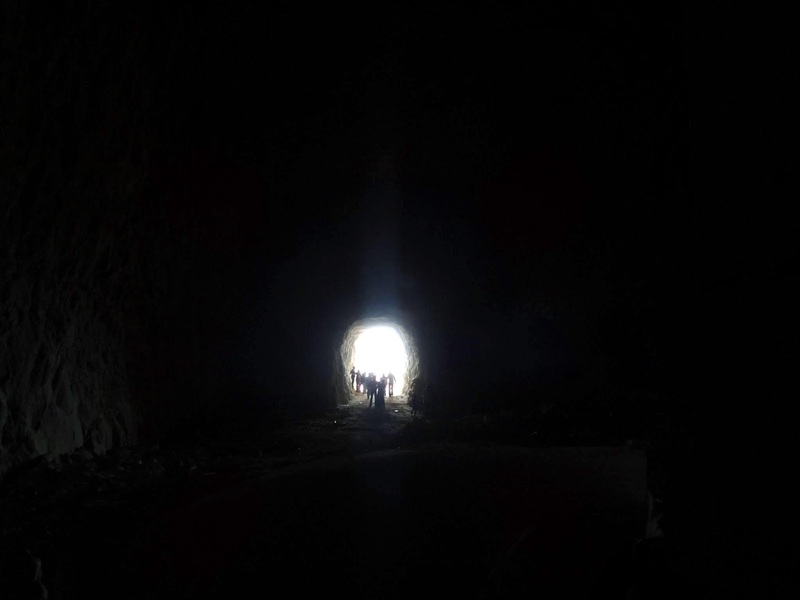 At 2:30, we travelled to kailasagiri, and experienced the beauty of the cave. The idols were carved magnificantly. Reaching the bus, we had a quick feedback session where everyone shared their views of the trip and many wanted to come to the next trekking also. On request of the trekkies, the bus travelled from old madras road. 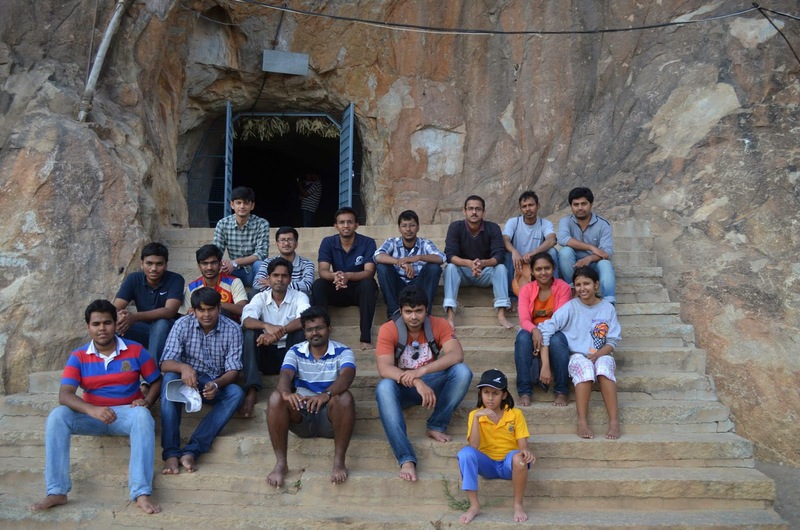 Totally an awesome experience at just Rs.330!!. More than money it was the feel of friendliness which we all felt and thanks for mother nature. Thank you BTC.